Freakwater is propelled by what has been called "acerbic harmonies", a wrenching but wonderful sound that goes straight back to Sara and Maybelle Carter's original prescription: Keep it plaintive, rough, and real. (The pleasure of listening to Catherine & Janet sing is sort of like the pleasure that can be taken from from weeping.) Lyrically, however, Freakwater departs from the morality & themes of traditional country music. Though they may have excommunicated themselves from country's songbooks, Freakwater's work still has plenty of appeal to anybody who's suffered or has a large axe to grind; that is, most everybody. 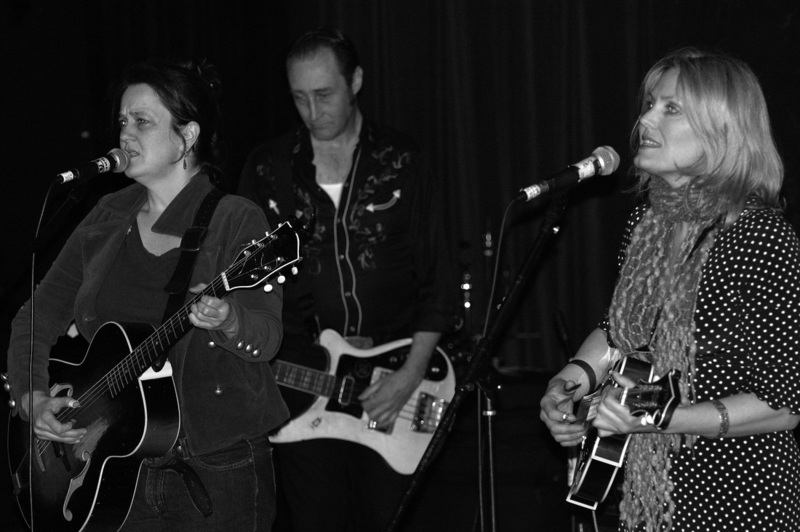 Freakwater knows what must be the most fruitful long-distance relationship ever: Three hundred miles of interstate have lain between Janet and Catherine, the main creative forces of the band, since soon after Freakwater's inception. CATHERINE ANN IRWIN has called Louisville, Kentucky home, or at least her home base, all her life. She began performing by playing guitar in punk bands "and not caring a bit about country music," she says. Still, the seed for Freakwater was inside her: "Most of the country music I heard on radio, I hated. But I loved the Carter Family, the way they would approach songs about death and dying or being saved and rejoicing the same way. That kind of music seems to age better. I can't see myself playing punk anymore, but this kind of music I can see playing the rest of my life." Her songs are just packed with sapience, despondency, and wry wit, though you don't have to look past "Louisville Lip" or "Dirty Little Snowman" to see she's one of America's greatest living songwriters. Even so, she remains humble, even self-depreciating: "If I had a master plan, it'd be trying to get people used to the idea of frumpy middle-aged losers singing music." JANET BEVERIDGE BEAN also came of age in Louisville, but became a Chicagoan in the mid-80's, chasing her rock 'n' roll dreams with songwriter/guitarist Rick Rizzo. Together, they are the heart of the long-standing Eleventh Dream Day, for which she writes, sings and plays drums. (Chicago Magazine has described Eleventh Dream Day as "Chicago's most underrated band".) "I just write about what I know. . .. The only thing I can do is be up late at night, miserable, and something comes out of me. It's generally really personal and written at very, very difficult times." Her contributions to Freakwater's repertoire, such as "Binding Twine" and "Double Clutch", may draw from real-life troubles, but their expression is celestial, or otherworldly. In 2003, Janet led a band called The Concertina Wire, with whom she released the underground pop marvel Dragging Wonder Lake. Songs there such as "One Shot" demonstrate her skill, the product of twenty years of work in music. She and journeyman Jim Elkington record as the Horse's Ha. And, most recently, Janet has formed the band Lagartha. DAVID WAYNE GAY, aka "The Undertaker", is Freakwater's long-time bassist, and has lived in Asheville, North Carolina since 1998. Onstage, his cigarette continually burning, Dave maintains a quiet, cool, and professional stance. His full contribution to the group will probably always be underestimated and never fully understood by folks on the outside. During his tenure with Freakwater, he has also been part of the Unholy Trio, the Reigning Sound, and the Krektones.